Much of what life brings us is the opportunity to help those who are less fortunate. Shelter, especially for the poor can easily and efficiently supplied with bamboo. This concept has been explored by the greatest influences in the bamboo construction field, as most believe this highest and best use of bamboo, especially our friends in South America Like Marcelo Villegas . Today much of what has come into the realm of bamboo construction has been very elaborate and ornate structures (see koolbamboo.com), and create a void in the idea that bamboo is material for the impoverished. The rediscovery of bamboo as a high tech material, especially Guadua Bamboo, has brought about the secondary effect of peaking the interest in people who are devoted to the development of low income housing. Our partners at Guadua Tech, made the decision to submit a design to Un techo Para Mi paiz , in order to develop a pod style kit home /emergency shelter. The first housing structure that Guadua Tech designed, for a completely unrelated low income housing project was not cost effective for the specifications laid out by Un Techo Para Mi Paiz . 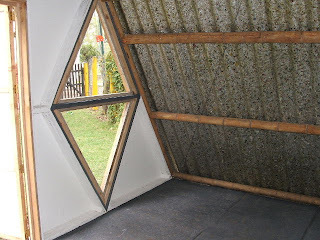 The second and final design incorporates recycled plastic panels with Esterillia (Guadua bamboo Poles broken into sheets) , Esterillia ply wood panels, and the Guadua Tech ends. The final model easily assembles in 4-6 hours, it comes in a box and weighs less than a ton. The representaives of Un techo Para Mi paiz gave the structure its first look a couple of months ago and showed great interest in it. The technologies used in this design are cutting edge in the field of bamboo. The Guadua Tech end is the only patented bamboo connection system that utilizes Guadua Bamboo Poles from the extreme ends so as to reduce redundancy in design. Esterillia Bamboo sheets are manufactured like ply wood using Guadua Bamboo poles ( a renewable resource) in a modern factory with high heat and pressure. The recycled boards are a combination of recycled plastic tin foil and paper pressed with heat in a form to create roofing panels. This innovative structure has a very broad appeal for the victims of disaster, housing for poor and the not so poor people who recognize the versatility of such a structure.